The EU aims to reduce greenhouse gas emissions by 40 percent until 2030 compared to 1990. Therefore conservation of peatlands must be integrated in the climate and energy policy. 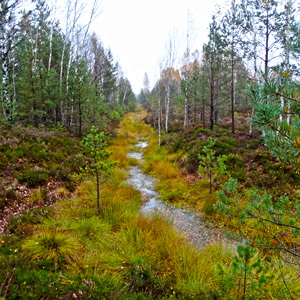 Especially the Baltic States as well as Poland and Germany have huge areas of peatlands, which are partly heavily degraded and which need conservation and restoration. The project area is one of the global emission Hot Spots, where the potential to save greenhouse gas emissions is exceptionally high. Intact peatlands store about 30 percent of the global carbon on three percent of the land area, which is twice as much as all woods together. The peatland vegetation absorbs carbon dioxide from the atmosphere and stores it with the help of biological processes in the peat for a long term. 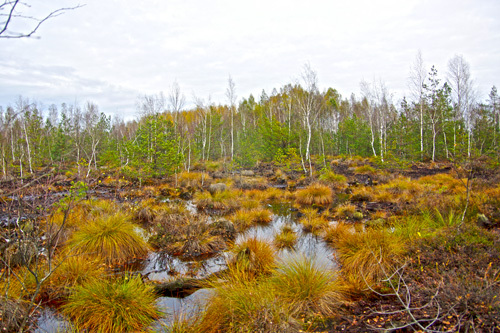 Intact peatlands, especially several meters deep ones, are therefore huge stores of greenhouse gases and contribute to a long-term cooling of the atmosphere. 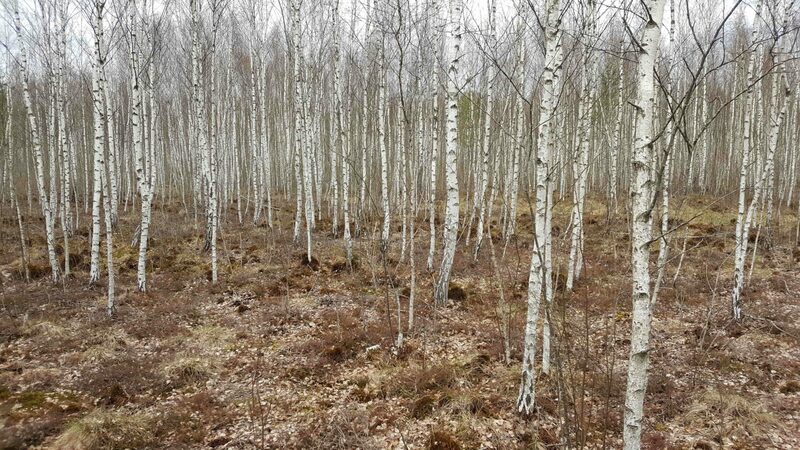 The LIFE Project Peat Restore aims to rewet degraded peatlands in the partner countries Poland, Latvia, Estonia, Lithuania and Germany, covering an area of 5,300 hectares to restore the function as carbon sinks. The drainage of peatlands for agricultural use or peat mining contributes severely to the global carbon emissions. During the drainage, oxygen gets into the peat, which leads to aeration and decomposition of organic matter into smallest parts. In this aerobic zone microorganisms are extremely active, so the rate of decomposition is especially high. As a result the greenhouse gases carbon dioxide (CO2) and nitrous oxide (N2O) are emitted into the atmosphere, what reverses the function of peatlands as a store into a source of greenhouse gases. The project area was formed by the ice age with its valleys and depressions. After the latest ice age, the rise in temperatures caused the deglaciation of ice crusts which released huge amounts of water into the landscape. Together with high penetration the water table rose and large areas got flooded. 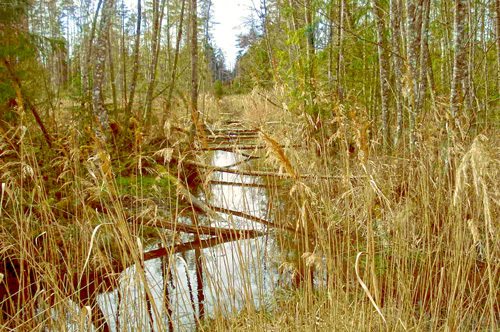 With the time, vegetation adapted to this high water level and complex peatland ecosystems developed. The northern and north-eastern European countries as Latvia and Lithuania have huge peatland areas, which partly reach a few meters in depth. Due to peat mining and the intensification of agriculture and forestry, peatlands were increasingly drained. In these areas peatlands are currently emitting great amounts of greenhouse gases. In the global context Poland and the Baltic States are the Hot Spots of emissions, coming from drained peatlands after Indonesia, Russia and China (Joosten 2010). But also Germany ranks ninth on the global list of emissions of degraded peatlands. 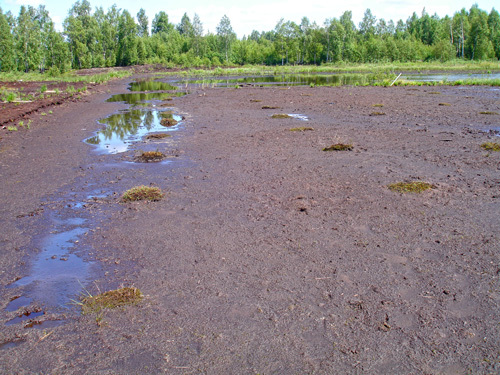 Europeans peatlands are heavily drained. 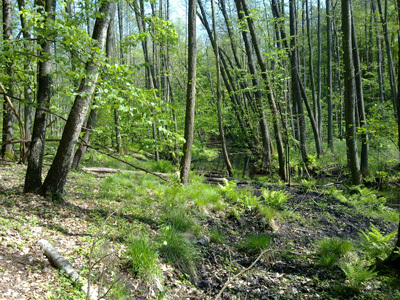 With 93 to 95 percent Germanys peatlands are in a bad condition. 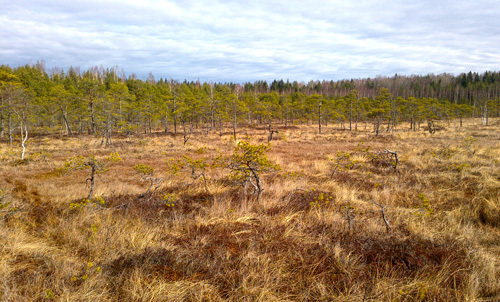 But also in the Baltic States a huge percentage of the sensitive peatlands are degraded. 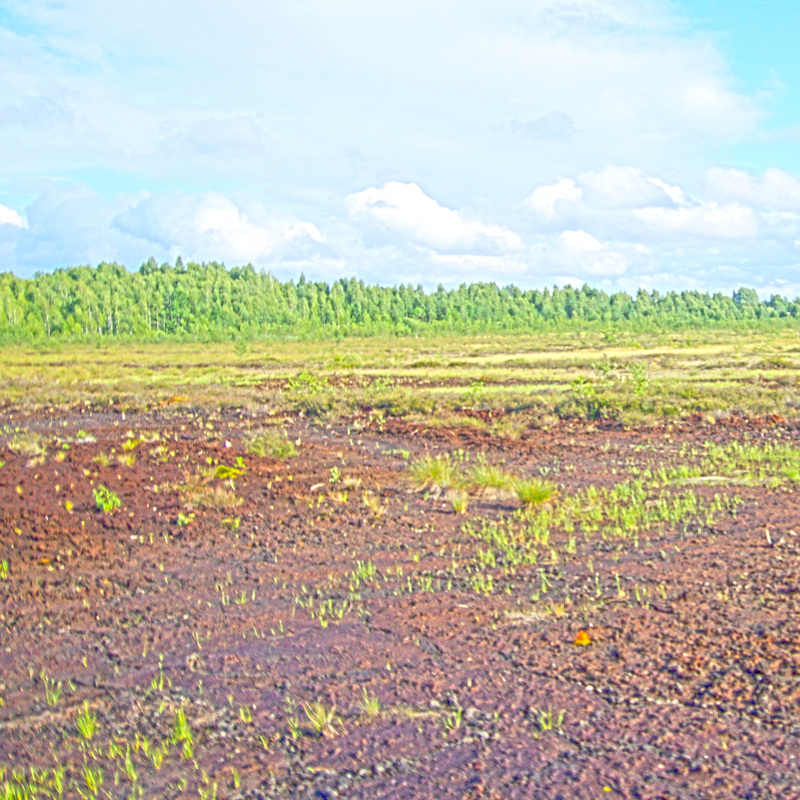 The aim of the project is to stop the degradation of peatlands, which is caused by drainage. Via adapted management and annually high water levels peatland growth will be supported to fix carbon dioxide . To rise the ground water level within the project sites, measures will be implemented. These are hydrological measures as blocking ditches and building dams to retain water in the peatland. 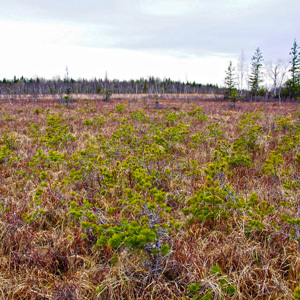 Bushes and trees, which are not typical for peatlands and have a great water demand, will be removed. The accumulation of peat will be higher than the decomposition, so that the total carbon balance becomes positive. 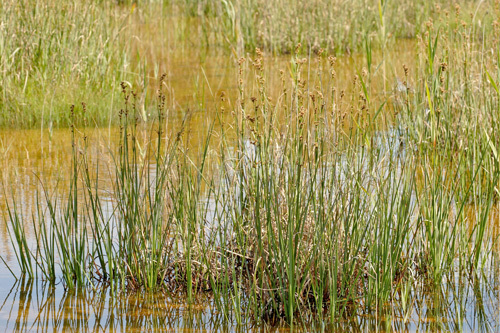 The restoration measures are positive for the characteristic peatland species, which are highly adapted to these wet ecosystems and their extreme conditions. The effects on the carbon balance and the effectiveness of the restoration measures will be documented by a monitoring, which comprises the direct measures of greenhouse gases with chambers, the mapping of flora and fauna and the monitoring of the water level in the project areas. Socio-economic impacts will be analyzed by means of indicators. The results of the project will be summarized in a guide for peatland restoration, which will be available for several stakeholders. Fourth National Communication under the UN FCCC: in Worldbank (o. J. ): Polands Greenhouse gas emissions. [Status: 19/01/2017]. NIR – Nationaler Emissionsbericht (2010): Berechnung der Emissionen aus der deutschen Landwirtschaft – (NIR) 2010 für 2008. [Status: 22/01/2017].